Drivers in America are no strangers to car accidents, and neither are drivers in Nevada. While the facts of each Las Vegas car accident can be as unique as the parties involved, there are some types of accidents that are more common than others. Below are the most common types of Las Vegas car accidents. Distracted driving: With technology always at the tips of our fingers, distracted driving has risen to levels never before seen in our history. Moreover, electronic devices are not the only distraction behind the wheel — eating, grooming, changing the radio or air conditioner settings, and even chatty passengers can all take a driver’s attention off the road. Driving while under the influence: Whether it is driving drunk or while on drugs, a DUI/DWI is a serious offense with harsh penalties that can result in severe injuries or even death. In Nevada it is illegal to drive a vehicle with an open container, with limited exceptions.The legal blood alcohol concentration (BAC) limit is 0.02% for drivers under the age of 21, 0.04% for commercially licensed drivers, and 0.08% for all other drivers. Head-on collisions: Perhaps the deadliest and most violent types of collisions, these crashes can result in broken bones, brain injuries, and death. Many of these accidents happen on Nevada’s rural roads and/or interstate highways like I15, I-215, and SR 80. There can be several causes of head-on collisions including unsafe lane changes, wrong turns, failure to obey traffic signals, and drunk driving. Hit-and-run accidents: Fleeing the scene of a car accident is a criminal offense in Nevada and in other states across the country, even if the person who leaves was not at fault. Nevada law mandates that everyone involved in a car accident exchange contact and insurance details. Fleeing the scene when there was property damage is a misdemeanor offense, while doing so when there was injury or death is a felony. Rear-end collisions: Perhaps one of the most common types of car crashes in the country, these happen typically when one vehicle is following another too closely. When this happens, the vehicle in the back does not have enough distance or time to brake properly and as a result, the driver who rear-ended the other is found liable. Side-impact crashes: Often referred to as T-bone collisions, these accidents typically happen at an intersection and are the result of one driver going through a red light. Because either party involved can be at fault in a side-impact crash, it can often be difficult to prove liability. 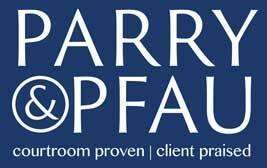 At Parry & Pfau, our skilled Las Vegas personal injury attorneys have the experience and dedication to fight for the monetary compensation to which you are entitled. If you or someone you know has been hurt in a car accident due to another’s negligence, or hurt in any other type of accident, contact us today. Older PostIs Lane-Splitting Legal in Nevada?